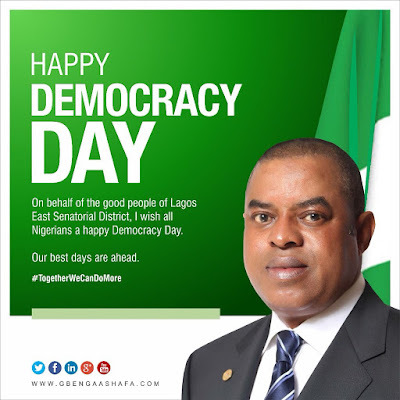 As we mark the 2018 Democracy day of our dear country Nigeria and the 3rdyear anniversary of the President Muhamadu Buhari led, All Progressives Congress administration, I would like to thank all Nigerians for your support this far. Your constructive criticism, your alternative opinions, your support for the institutions and policies of government and prayers have been the needed impetus for those of us in government to do more. In the past 3 years, the Buhari/Osinbajo led government has reconstructed a foundation of socio-economic growth and development founded on the ideals of our constitution (Unity and Faith, Peace and Progress) and the ideals of our party. We are gradually beginning to experience prudence and attitudinal change in public service, a stiff fight against corruption, massive infrastructural development particularly in the areas of rails, roads, power and housing. There is also a sincere battle against insecurity and a commitment to creating a country that holds the promise of a secure future for our teeming young population. In this final lap of this administration’s first term, I think it would be wise for Nigerians to realise that Democracy is founded on people representation and a balance of opinion on one hand as well as establishment of strong institutions on the other. In essence, we must continue to engender the National conversation with a view to ensuring that our aggregate opinions are always represented and the sanctity our National Institutions are always protected. The key to this is participation. Consequently, as we gravitate towards the political season I urge all Nigerians to participate actively in the entire process. Please be reminded that participation is as much a duty as it is a right. We must therefore all be invested in ensuring that the solid foundations built by this administration are consolidated upon. As I conclude, I urge all Nigerians to remember that sustainable development can only be achieved in an atmosphere of peace. We must therefore come together to ensure that there is no hiding place for criminals seeking to destabilise this country through bloodletting and violence. Happy Democracy day Nigeria, together we can do more.